I had a reasonable nights sleep rough camping. Like all animals, I marked my patch, not sure if essences of Nick is a Feral Pig attractant or retardant, either way they kept their distance. I woke early and had the usual raisin toast and tea at the very establishment that had refused to accommodate me, it was the only place in town,. 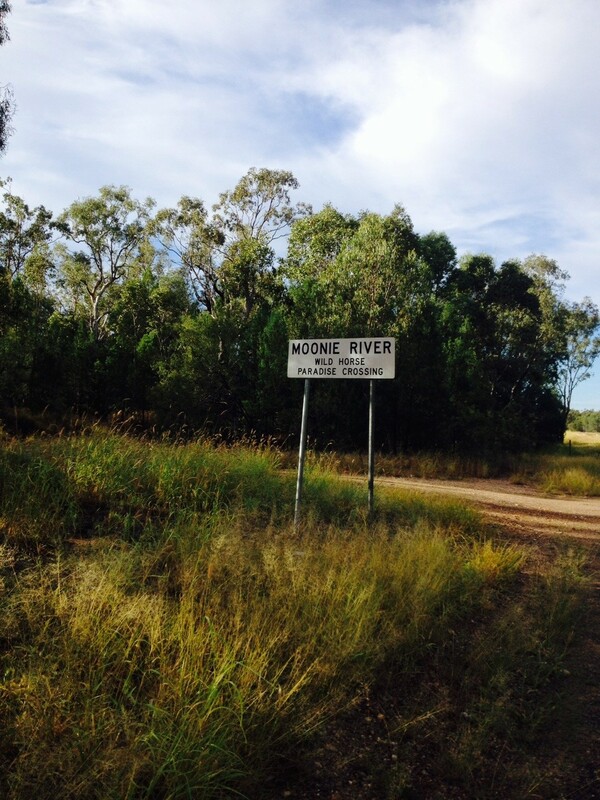 In fact it was the town, Moonie is just a name given to a crossroad in an oil exploration area. The weather was mild and any breeze there was favoured me as I set out on the 130 kms ride to Miles. It proved a day for the birds, with the recent rain, sunshine and fertile country. Insects, frogs, butterflies and birds were everywhere. At one point while riding I saw so many crows you would have to call it a mass murder! Later a hooded insect eater, which may be it’s actual name, made a precision strike on a couple of courting butterflies picking one off directly in front of me, leaving the other to dance alone. Cattle or “scrubbies” roam fairly freely often onto the road. A couple of times I made eye contact with these animals, we gazed at one another across species. The wallabies made their regular appearance, as did currawongs, galahs, finches, swifts and budgerigars. Stopping half way for lunch at a roadside rest stop, a caravan pulls in driven by a women with hubby in the passengers seat, sharing the driving or perhaps the dementia’s kicking in “Flies are a bugger”. “You got a motor on that?” she asked pointing to Mr Surly and BOB. “Thanks” I said and you too. Arriving in Miles I paid $20 for my campsite before really seeing what was on offer. The ground was hard and gravelly and it was too close to the highway with a filthy amenities block. I made a quick visit to the Information Centre (an Orwellian sounding name) and spoke to the older women who volunteered there.